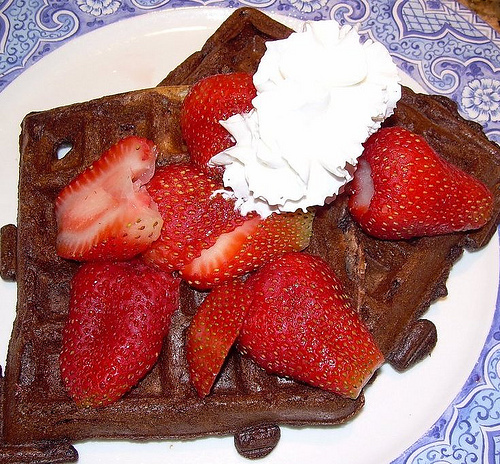 Mrs. Chow's Kitchen » Post Topic » Whole Wheat Sourdough Chocolate Waffles – Fantastic! Whole Wheat Sourdough Chocolate Waffles – Fantastic! The theme for Frugal Fridays is to use ingredients I have on hand so they don’t go to waste. Recently, I made some Italian Knot Rolls and, because I halved the final recipe, I had some biga left over. While perusing one of my favorite baking books, King Arthur Flour Whole Grain Baking: Delicious Recipes Using Nutritious Whole Grains , I came across a recipe for Sourdough Chocolate Waffles. I used the leftover biga, and added some buttermilk until the mixture looked “right.” I know that’s not really helpful, but the starter is supposed to be 100% hydration. Judging by the incredible, mouth watering, gut-busting results, I think I got the proportions correct. These are some of the best waffles I’ve ever eaten. They were better than most chocolate CAKES I’ve ever had. I had some left over so I froze them, and they were good FROZEN. By that I mean we didn’t even bother to toast them, they were so good. Even my husband loved these, and he’s not a big fan of chocolate. The waffles are a bit soft when they come out of the iron, but if you let them sit in a 150 F oven on a rack, they will firm up. I will be making these again and again, and I’m so happy to have found another recipe for my leftover sourdough toss off and biga. You may also be interested in this recipe, which is a lot like the one in the book. And be sure to check out Susan’s weekly Yeastspotting roundup! 1) To make the starter: Measure 1 cup sourdough toss off into a medium bowl. 2) Stir in the water or buttermilk and whole wheat flour, and mix until thoroughly combined. 3) Cover the bowl and set it aside at room temperature for several hours, or up to overnight. 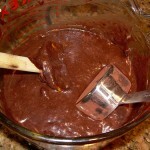 4) To make the batter: When you’re ready to make the waffles, whisk the dry ingredients in a small bowl; you may need to sift the mixture if your cocoa is lumpy. 5) Add the dry ingredients, plus the eggs, melted butter, vanilla, coffee, and chocolate chips to the sourdough batter, stirring to combine. 6) To bake the waffles: Drop about ½ cup batter onto a greased, preheated waffle iron. Bake the waffle until steam stops coming out the sides of the iron. The waffles will feel soft and tender coming out of the iron, but will crisp up on standing. 7) Serve with sliced fruit, ice cream or whipped cream, if desired. This looks delicious!!! Oh, I love waffles! I so need to make these. They look wonderful! These look so good I could cry. All of you bread baking bloggers are taunting me with your fabulous breads, and I have never mastered (or to be fair, attempted) yeast. I must step away from the sidelines and jump into the game. Must. Make. These. OH yea! Another great use for toss off. I love chocolate waffles but I hadn’t used my starter toss off before. I’m so making these. I wish I had a waffle iron. Waahn!